Did you remember to sign up for Starhawk's multiplayer public beta? Of course you did. What kind of forgetful cad would miss out on the totally open beta that began on February 21st? Now, if you'll excuse me while I wait 28 minutes for this download that has nothing to do with the Starhawk beta --and then wait another hour or so to give me an opportunity to play this totally unrelated game; I'll let you know if you should jump into the Starhawk MP fray... Until then, why don't you check out this sweet new video! I have a feeling someone's about to get Dorothied! And we're back! After logging literally hundredths of an hour into the Starhawk MP beta, I can easily recommend giving it a go. It is free, after all. I had a hard time connecting to a game at first, but man, it's a blast. Jetpacks are easy to use and the weapons feel nice. I managed to procure a Hawk. I couldn't figure out how to make it fly, so I was hopping up and down in my mech as other pilots flew past me. This naturally made me a giant target on the battlefield. Some little SOB from the opposing team took the opportunity to unload his rocket launcher into my face. What a jerk. I redeployed nearby (think orbital dropping from Section 8) and shot him out of the sky with my standard assault rifle as he tried to jetpack away from a different firefight. Revenge was mine! The beta features Capture the Flag and Team Deathmatch modes with more to come in the main game. While there is no co-op available in the beta, you'll be able to familiarize yourself with the weapons, vehicles, and the building process. Check out the Starhawk wiki if you want a heads-up on the controls. Button layouts may be available through the in-game option menus, but I didn't see them. I can honestly say I'm looking forward to this one. 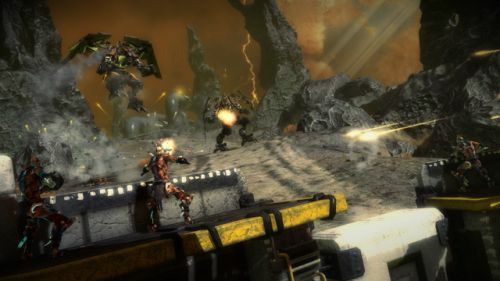 Starhawk will be out on May 8th, exclusively for the PS3. It supports two player local split screen co-op and four player online co-op. Page created in 0.4211 seconds.